Jeddito Black-on-yellow bowl. Click the image to open the Jeddito Black-on-yellow gallery. 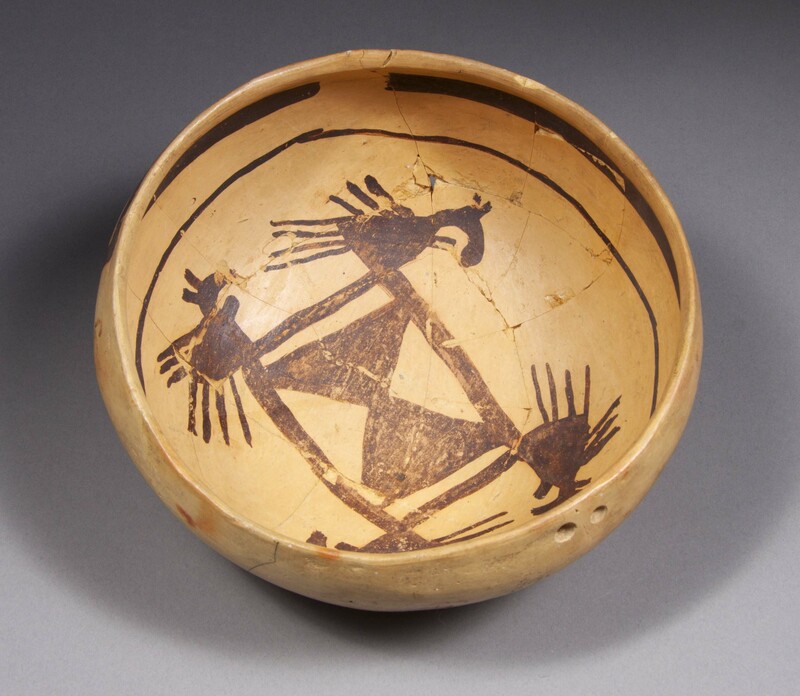 Jeddito Black-on-yellow was produced primarily on Antelope Mesa and Third Mesa in the Hopi area, but like other Jeddito Yellow Ware types, is found as a trade ware in northern, central, and east-central Arizona. Date Range: A.D. 1325 to 1600. Core Color: Generally yellow; pinkish in some specimens. Temper: Fine quartz sand rarely visible to the naked eye; occasionally reddish angular fragments; sand temper rarely visible without a hand lens either in cross-section or on vessel surfaces. Surface Finish: Smooth, highly polished and compacted; occasionally few minute whitish or yellowish flakes visible on the surface, but not in cross-section. Surface Color: Cream to bright yellow (yellow predominates); over-fired specimens orange or metallic; surface and core do not contrast. Vessel Thickness: 3.7 to 10 mm, average 6.1 mm (bowls); 4.3 to 9 mm; average about 6.5 mm (jars). Design: Geometric; occasionally life forms. Bowl interiors and jar exteriors always decorated; bowl exteriors sometimes decorated; flared lips on jars sometimes painted on interior. Comparisons: Awatovi Black-on-yellow, which has less homogeneous paint, temper, and core color; Jedditto Stippled, which has splattering or sponge-like paint applications; Jeddito Engraved, which has designs engraved into the paint; and Paayu Polychrome, which uses different paint densities to achieve more than one color. Colton, Harold and Lyndon L. Hargrave. (1937) Handbook of Northern Arizona Pottery Wares. Museum of Northern Arizona Bulletin No. 11. Flagstaff, Arizona. Lyons, Patrick, and Kelley A. Hays-Gilpin. (2001) Homol’ovi III Ceramics. In Homol’ovi III: A Pueblo Hamlet in the Middle Little Colorado River Valley, Arizona, edited by E. Charles Adams, pp. 132-226. Arizona State Museum Archaeological Series 193. University of Arizona, Tucson. Smith, Watson. (1971) Painted Ceramics of the Western Mound at Awatovi. Papers of the Peabody Museum of the American Archaeology and Ethnology, Vol. 38. Harvard University Press, Cambridge.